Are there nodules in the same lobe or is there chest wall, diaphragmatic, phrenic, mediastinal pleural or parietal pericardial invasion, lung collapse or main bronchial involvement < 2 cm from the carina? Is there mediastinal, great vessel, carinal, vertebral body, oesophageal or recurrent laryngeal nerve invasion? Or are there tumour nodules in the same lung, but different lobe(s)? Is there ipsilateral hilar lymphadenopathy? Is there subcarinal lymphadenopathy or ipsilateral mediastinal lymphadenopathy? Is there supraclavicular, scalene, distant or contralateral hilar or mediastinal lymphadenopathy? Are there contralateral lung nodules (metastases), is there a malignant pleural or pericardial effusion, or are there pleural or pericardial metastases on either side? Following assessment of prognosis in 81495 patients with either small cell or non-small cell lung cancer(1), the seventh edition of the TNM classification for lung cancer was published in 2009. A summary of the staging system is shown below. The overall staging clearly changes with the above (e.g. with nodules in the same lobe, but no nodal or metastatic disease, the tumour becomes IIb disease rather than IIIa), but also, T4 tumours that have N1 disease or less are staged at IIIa and T2b with no nodal disease equates to the same overall stage as T2a with N1 disease. Where the tumour, nodes or metastases cannot be assessed, the suffix x is used and when there is no evidence of tumour, the suffix 0 is used. T1 – surrounded by lung or visceral pleural without pleural invasion. T2 – may involve a main bronchus, but not less than 2 cm from the carina. May invade visceral pleura. T3 – any of: size > 7 cm, tumour nodules in the same lobe, chest wall or diaphragmatic invasion, whole lung collapse or obstructive pneumonitis affecting the whole lung, mediastinal pleural or parietal pericardial invasion*, tumour in a main bronchus less than 2 cm from the carina, or phrenic nerve invasion. T4 – any of: tumour nodules in the same lung, but different lobe(s), mediastinal, great vessel, carinal, vertebral body, oesophageal or recurrent laryngeal nerve invasion. N1 – ipsilateral hilar involvement. N2 – ipsilateral hilar, mediastinal or subcarinal involvement. N3 – supraclavicular, scalene, or contralateral hilar or mediastinal lymph node involvement. The left border of the trachea is used a landmark for N3 disease in stations 2 to 4, so that pre-carinal lymphadenopathy in a left sided tumour is N3 disease, but in a right sided tumour only N2 disease. M1a – malignant pleural or pericardial effusions, pleural nodules or nodules in the contralateral lung. Figure 9 (above): M1a disease with both pleural and pericardial effusions. M1b – extrathoracic metastases including distant lymph nodes. Figure 10 (above): M1b disease with liver metastases (arrowheads). The pericardial effusion (arrow) on its own would be M1a disease. Each TNM stage can be assigned to the Roman numeral staging system with stages I-IV where higher stages are associated with a poorer prognosis. The following diagrams all demonstrate which TNM stages are in which overall staging group. Pick the diagram you find easiest. Table 4 (above): Overall stage according to T and N status. Table 5 (above): T stage required for each stage according to N status. Table 6 (above): T stage required for each stage according to N status. Figure 13 (above): Overall lung cancer stage (y axis) at each T stage for N0, N1, N2 and N3 disease. Image courtesy of Dr S Ellis. Table 7 (above): Nodal zones and stations according to the International Association for the Study of Lung Cancer (IASLC) node map. (Source: 2,3) *Depends on the side of the tumour. N.B. This image is rendered poorly in old browsers. Click here for a full size image (you may have to click to zoom once it is loaded). Figures 14-29 (above): Axial and coronal locations of lymph node stations 1 to 13. 1. Rami-Porta R, Crowley JJ, Goldstraw P. The revised TNM staging system for lung cancer. Ann Thorac Cardiovasc Surg. 2009;15(1):4–9. 2. Goldstraw P, Crowley J, Chansky K, et al. 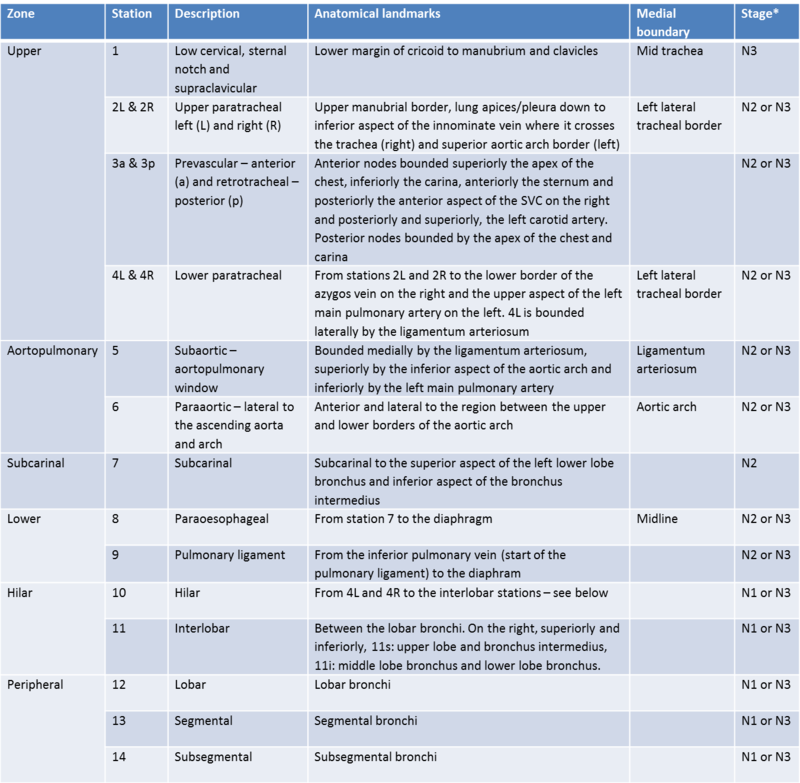 The IASLC Lung Cancer Staging Project: proposals for the revision of the TNM stage groupings in the forthcoming (seventh) edition of the TNM Classification of malignant tumours. J Thorac Oncol. 2007;2(8):706–714. 3. Rusch VW, Asamura H, Watanabe H, et al. The IASLC lung cancer staging project: a proposal for a new international lymph node map in the forthcoming seventh edition of the TNM classification for lung cancer. J Thorac Oncol. 2009;4(5):568–577.